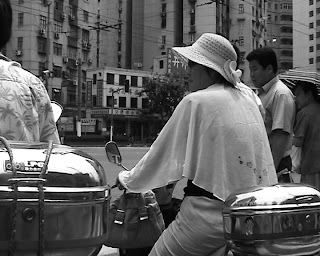 Now that summer is here, Shanghai’s caped crusaders fly through the city on mopeds and bicycles.And what are they crusading for? White skin.Tans are a no-no for most of the city’s women and the cosmetics industry is making a killing with skin whitening creams.For those looking to join the trend, capes accessorize well with gloves and hats. Add shades for that extra cool look.